Lahore: Ameer, Jamaat e Islami, Pakistan, Senator Sirajul Haq, has said that the JI had opened its doors to the common man so that competent people having good reputation could become JI members and rise to higher positions in the society. 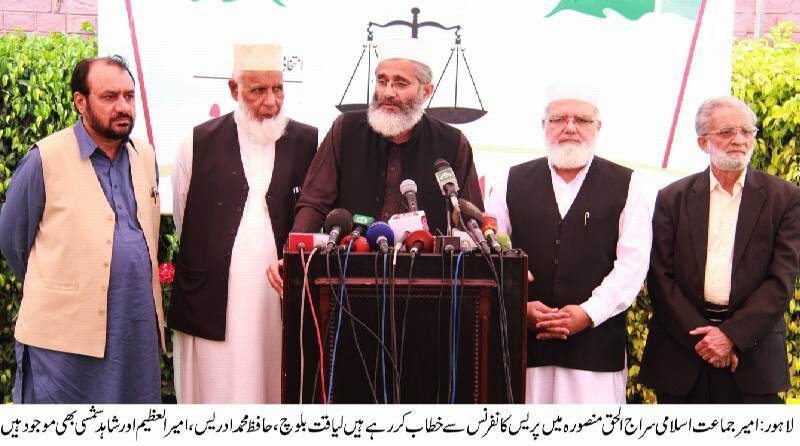 Addressing a press conference after presiding over a special meeting of the JI leaders at central, provincial and district levels, at Mansoora on Saturday, he said the JI aimed at amassing public support so as to oust the colonial agents ruling the country for the last 68 years. He said that his real target was the oppressed sections of the society, the tonga drivers, cobblers, and the poor lying on footpaths. He said the JI would emerge as a strong public power in the local bodies’ elections and the next general elections. Replying to question on the Gulf situation, the JI chief said that the US and Israel had always benefited from the wars in Gulf that enabled them to weaken the Muslims and grab their resources. As such, the leaders of the Muslim world should sit together and devise a strategy to foil the enemy d plans. He said that Turkey and Pakistan should play mediatory role in the Gulf crisis. “We want that the Saudi Arabia-Iran confrontation should not deepen as millions of the Muslims were killed in the Iran-Iraq war during the last century. That tragedy should not be repeated”, he added. He said the US wanted to make the Gulf a battleground once again to sell its arms and ammunition, he added. Sirajul Haq said that the JI local leaders would go to the people in every village, goth and towns, city during a membership drive from April 3 to 15, communicate with the social, political and economic programme of the party and enlist new members. The Pakistani community, including the Christians, Hindus and Sikhs would also be inducted into the JI, he added. The JI chief said that Pakistan and oppression could not go together any more. He said that the conflict in the country was not between nationalities, it was between the oppressor and the oppressed. He said that Pakistan had lost its eastern wing only because of the tussle between the tyrant and the oppressed. However, he said, the oppressor could not be allowed to play with the destiny of the country any more. Senator Sirajul Haq made it clear to the poor masses that a change was not possible merely by cursing the oppressors, the plunderers and the corrupt rulers. For a change, they would have make a common cause with the JI on this score and join its struggle. He said that the general public was a witness to the credibility of the JI members. However, he said that simply paying a lip service to the good conduct of the JI was not enough, and the people should step forward and join its struggle for an Islamic revolution which alone could bring stability and prosperity to the motherland. He said it was unfortunate that the oppressed and the deprived masses in the country stood divided while the corrupt tyrants always joined hands to protect their selfish interests.